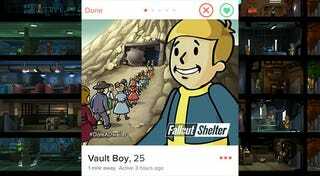 Vault Boy probably hopes you’re willing to swipe right. Reader Jason Mol sent us a curious screenshot earlier today of a profile he came across while using dating app Tinder. Turns out, Vault Boy himself is on the service. Apparently he’s age 25, and if y’all hit it off together, who knows, maybe you can be the next Overseer? But let’s just see how it goes, first. Now, joke Tinder profiles are a dime a dozen—anybody could have made this profile. Thing is, it’s actually official. Bethesda made it. They’re advertising the profile on official Fallout channels, like the Fallout Twitter page. There’s even an associated hashtag for this called #dateadweller, where you can learn HOT TIPS like how high charisma might be useful in the dating scene. Jason Mol tells us that when you click on the profile on Tinder, it actually takes you to a download link for the Fallout Shelter; there’s nobody actually waiting somewhere, talking to people. That would have been neat. Butch is cool. But what about this gal? Follow your hearts, wastelanders. Or at the very least, be skeptical of Vault Boy. I hear vault guys just like to hit em and quit em.